In this fine National Portrait Gallery retrospective, Mary Panzer convincingly portrays Brady and his studio as a patriotic nation building venture aimed at creating the illusion of a coherent republic during the most fragmented period in U.S. history. A particularly well produced collection, Image is also a first class history and a beautiful monograph. Much of our image of the Civil War era comes from the photographs of Matthew Brady, and in Matthew Brady and the Image of History Mary Panzer, curator of photographs at the National Portrait Gallery in Washington, D. C., examines the work of this American icon. Brady, she writes, "used art to forge a relationship between photography and history, but when the memory of Brady the artist vanished, we came to accept his images as facts." Brady composed his photographs along classical models, always seeking the heroic in his subjects--who, until the advent of the Civil War, tended to be the business and social leaders who could afford his fees. 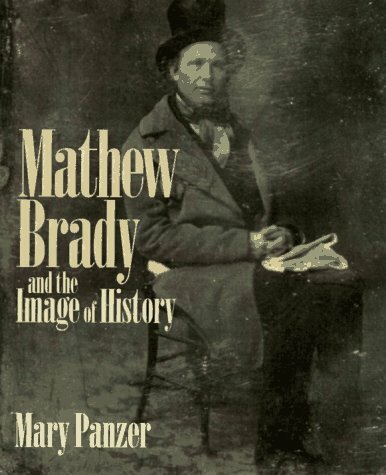 Panzer's account of Brady's wartime work is especially revealing: where assistants like Timothy O'Sullivan and Alexander Gardner favored realistic studies of the dead in battle, Brady favored sweeping panoramas that obscured individual soldiers. For all that, it is Brady we remember as the man who, a contemporary journalist observed, "has done something to bring home to us the terrible reality and earnestness of war." The book is richly illustrated with the work of Brady and his carefully credited assistants, and it deserves a place in the library of anyone with an interest in 19th-century American history.